One of the most popular questions asked by visitors to The Ashurbanipal Library: “What’s the oldest book in your collection?” We point them to the back of the library, where in a glass case sits a large, aged book—The Book of Khudra from 1676. Just as interesting as the book itself is the history of how it found its home at our library. Hear the story of what it is, how it was found, and the treasures it holds as told by co-founder of The Ashurbanipal Library, Robert DeKelaita. Over 30 years ago, in the old bookstore of O’Gara and Wilson, we stood chatting before paying for some old books. Peter Bet Basso and I had just found some interesting books to purchase for The Ashurbanipal Library that we had cared for. It was a weekly ritual for us; we would often hunt around for books on Assyrian history for the library. “What language are you speaking?” one of the owners asked us. The next day I came to the bookstore, I was led down an old hallway, then a creaky and dark staircase, and finally into a room with a large wooden box. The man opened the box, took out a large book with leather and wood covers, placed it on a desk, and opened it to pages in the center. I was overcome with many emotions. This ancient book, with tattered pages, had the language of my fathers on it. It smelled of bisma, or incense, from a church long ago. Its writing was by hand, of course, a skilled hand. But I was too lacking in knowledge to know what it was and so asked the man to allow me to bring our scholars to see it. A few days later, with a number of persons who new better, we again visited the ancient book. This time, the Assyrian priest with us knew exactly what the book was and what year it was written in. When you look at this book, recall the long road it has taken to be here. Recall that the Assyrian scribe who wrote it took great pains to pass on the Christian Assyrian heritage on to the future generations. 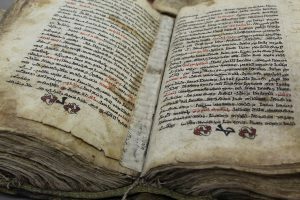 Recall also the hands that bound the book in the protective wood and leather so that it would last the centuries. Recall the priests and bishops that have held it and prayed with it by candlelight in remote villages high in the mountains. Try to hear their prayers and chants and smell the fragrance of the bisma they used. And recall, most of all, the language it was written in hundreds of years ago; a language that is spoken and written around you. Resting before you is a treasure that holds an ancient heritage that spans centuries. I hope your joy is as great as mine was over 30 years ago.